In the previous chapter of our Millesima Tips series, we discussed the benefits of ageing certain bottles of wine. We also listed some basic tips on how to store a wine to minimise the risk of wine faults, such as oxidation. In the 6th edition of Millesima Tips we will explore in greater depth the process of storing wine. We will focus especially on the variety of caves, cellars and cabinets designed to allow a wine to rest and age in peace. A traditional wine cave is a natural, underground or semi-underground structure most commonly found at wineries, but also at some private residences. These caves are built under a vineyard’s water bed to ensure cool temperatures and sufficient humidity. The characteristics of a natural wine cave depend on the terroir of the region where it can be found. Caves found at the chateaux of Bordeaux’s Right Bank, for example, were formed from excavations of limestone, from which many of the nearby city’s buildings were constructed. Some California wineries boast caves dug out from volcanic soil. Regardless of the specific properties of different wine caves, these environments tend to have in common a coolness (around 14°C), humidity (around 70°) and darkness, optimal for the peaceful ageing of wines. Under these conditions, a wine is less likely to degrade and lose quality. These conditions can also be artificially recreated in places where digging out a cave proves difficult. Chateau Cheval Blanc in the Saint-Emilion appellation is a famous example of an avant-garde, above-ground wine cellar that is completely man-made. In the 1970’s, refrigerated wine cabinets, closets and cellars appeared, perfect for personal use or for storage of wine at restaurants. These appliances imitate the conditions of a traditional wine cave and can be customised to fit any style or range of uses. Wine Serving Cabinets: As their name implies, wine serving cabinets are designed to bring wines to the perfect temperature before serving. This allows for the organoleptic qualities of the wine to be perceived in the right way. For example, a perfectly good red wine might appear closed with unpleasantly rough tannins if served too cold, while the alcohol in the wine can overpower subtler flavours and aromas if it is served at too high a temperature. Wine serving cabinets are perfect for short term storage with a high turnover. 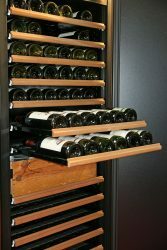 Wine Storage Cabinets: A serious wine collector, dedicated to the purchase and ageing of premium bottles, might want to consider a wine storage cabinet in which to lay down precious bottles for long-term storage. Wine storage cabinets come in many shapes, sizes and styles. They are often customised to fit nicely into their environment. These containers store wine in a consistent environment, at temperatures of 12-13°C and over 50% humidity. Multi-Temperature Cabinets: These multi-use containers combine the benefits of wine serving and wine storage by offering both a cellar space in which to age wine and a chiller box in which a bottle of wine can reach the correct temperature before serving. Eurocave also produced an “E cabinet,” which adds a warming box in the top to bring red wines to the right serving temperature. 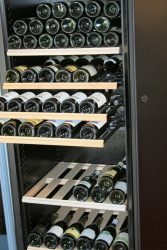 After reviewing the different types of refrigerated wine cabinets available, it is important to consider certain points before making a choice between them. Besides budget in term of the price of the cabinet itself, one should consider the energy requirement. Some cellars can be very energy-intensive, which means a higher monthly electricity bill. It is also important to consider sound output, as certain cabinets can be quite noisy. 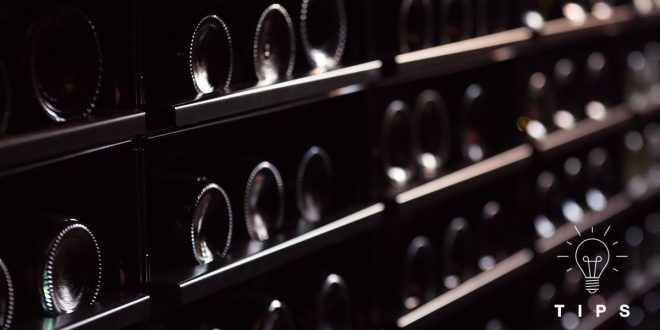 As with any investment, it is important to carefully plan the size of the desired wine collection and to choose a cabinet that can fit the collection. The capacity of a cabinet is often based on traditional Bordeaux-style still red wine bottles. Other bottle styles, such as Alsatian flutes, Champagne bottles, Burgundies and magnums will fit differently. Finally, choosing the right style of door is key. While glass doors are aesthetically appealing, since they allow for a proud display of prestigious labels, they often do not filter out the UV rays of the sun, which can degrade the wine over time. It is therefore important to consider a cabinet with glazed doors, which can be more expensive.